Right click on the model element, or the view of the model element that you want to apply stereotype to. Select Stereotypes from pop-up menu. Depending on the type of model element you are selecting, there may be a list of suggested stereotypes listing in the menu popped up. It consists of both the recently used stereotypes and stereotypes that place at the top of stereotype list. If you see the stereotype you want to apply, select it. Otherwise, select Stereotypes... at the bottom of the menu to look for others. 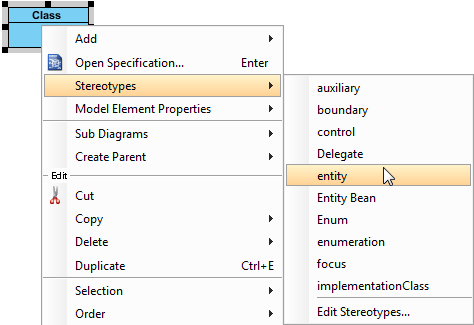 In the Stereotypes tab of specification window, select the stereotype you want to apply, then click > to assign it to the Selected list. NOTE: You can also double click on a stereotype to apply it. 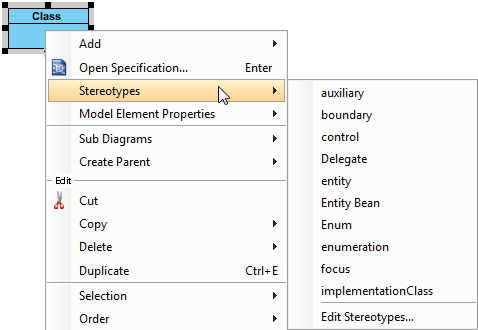 While clicking on > applies the selected stereotype to model element, you can click < to remove a stereotype selected in Selected list. If you want to apply ALL available stereotypes to model element, click >>, and likewise, clicking on << removes all the applied stereotypes. Robustness analysis helps to find out the relationships between actor, boundary, control and entity objects. Create a class in diagram. Depending on the type of robustness analysis symbol you want to create, apply either boundary, control and entity stereotype to the class. 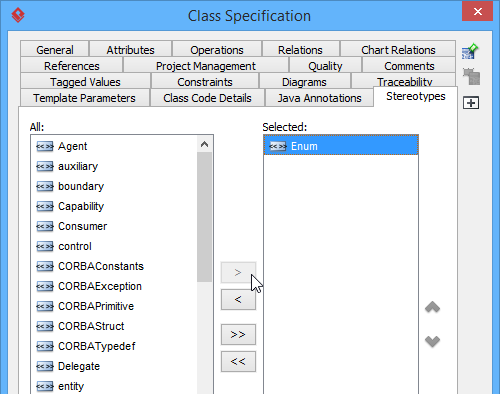 NOTE: If you want to let a class display as traditional class shape instead of robustness analysis icons, right click on the class and de-select Presentation Options > Display as Robustness Icon from the popup menu. You can specify icon for a stereotype (Read the next chapter for details). When a stereotype is applied to a model element, you can let the stereotype icon show above the name of model element, which is the default presentation, or to make the model element show as the icon. To present a shape as stereotype icon, right click on the shape and select Presentation Options > Stereotype Icon from the popup menu. By default, applied stereotypes are shown within a shape. Yet, it is up to you whether to show or hide them. Furthermore, you can choose not to display the stereotypes, but to display only their tagged values. To update the visibility of stereotypes, right click on the background of diagram where the shapes exist. Select/De-select Presentation Options > Show Stereotypes from the popup menu.